Last year, Red Sky began a new tradition. We want our team to have more of a say in where our philanthropic dollars go and to truly experience the power of giving. Through #RedSkyGivesBack, we give every employee $100, match up to $100 they contribute, and provide them the time and choice to figure out how to donate and get involved. Amanda spent her time with Camp Rainbow Gold, here’s a roundup of how the rest of the team gave back. Thanks to a good friend known as The Meridian Toymaker, I’ve been fortunate to receive many beautiful heirloom wooden toys over the years. 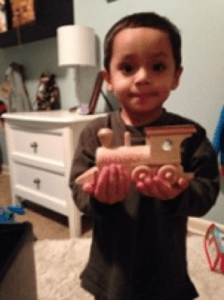 This year, he gifted me with a dozen small wooden trains emblazoned with Red Sky’s logo, only asking that we support his favorite charity – Keep Kids Warm – in exchange for the gifts. It’s been a delight to pass out these trains to my colleagues and see the pictures of their little ones enjoying them and putting them under their Christmas trees. 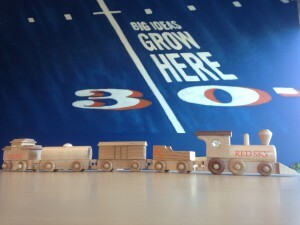 I’ve also given several to close partners, who embody the ‘little engine that could’ attitude we embrace as a small business working to make big things happen. Started in 1996, Keep Kids Warm is an annual giving campaign run by Kissin’ 92.3, and is the Valley’s largest coat drive and fundraiser to assist families in need with their gas bills during the winter months. The Meridian Toymaker has donated toys to KIZN’s annual on-air auction in support of the cause for years. Grateful that we got to play a small part this year in supporting his efforts! Spending time with friends and family is my favorite part of Christmas. My sister is a pediatric nurse and often works on holidays, which always makes me think of the families that are at the hospital that day and night. Unfortunately, those families with loved ones in the hospital don’t usually get to celebrate a traditional Christmas. As a parent, it’s hard to endure your kid having any type of illness, much less a serious disease or injury. Clearly your focus would be finding the best medical resources to make them better. But when those resources are far from home, it is an added burden both financially and emotionally. Living in Seattle, I remember my cousin and her family staying with us during visits to Seattle Children’s Hospital for multiple appointments and eventually surgery. I thought we were simply supporting family, but it really clicked when I worked with the great folks at the Idaho Ronald McDonald House and Western States CAT at an annual fundraiser a number of years ago. Providing that comfort, truly a home away from home, minimizes what can be a tremendously stressful time. The Idaho Ronald McDonald house does this every day for families throughout our region and a little donation can go a long way. You can also pick how you want to donate. My wife has cooked meals with her coworkers there, a list of needed items can be found on their website, or you can provide a monetary donation to contribute towards a few nights for a family. I didn’t get to shop this year as Amber did, but enjoyed doing so last year and focused my donations there again this year. We’re tremendously fortunate to have a resource like the Idaho Ronald McDonald House here in our region and the great people running it, and I feel the same about Red Sky for supporting the causes in the community that mean the most to us. This year, I decided to take the $100 Red Sky contribution and donate as many non-perishable food items as I could to the Idaho Food Bank. Before my shopping spree at Winco, I called the Idaho Food Bank to ask what they are most in need of. 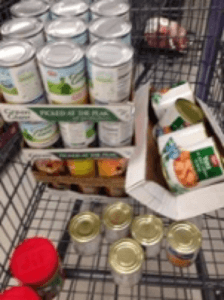 Healthy, non-perishable items such as peanut butter and canned vegetables are always great items. I purchased as many food items I could and delivered them to the Idaho Food Bank drop at 308 S. 24th St. the day before Thanksgiving. During my delivery, I noticed the food bank drop warehouse had other items such as furniture, toys and clothing. I found out that they accept a variety of different donation items throughout the year. Keeping on the giving track, I also donated $200 in Red Sky’s name through the Idaho Food Bank’s online site. Through the donation site, I learned that a donation of $200 dollars provides 800 meals to those in need. During the holidays when we are full and happy, it is important to assist those who may be experiencing hard times. I always look forward to this time of year and it’s great to work for a company that encourages giving back to the local community. There is something about doing good that leaves a warm fuzzy feeling that can’t be duplicated. As you may know, my husband is an officer for a police department in the Treasure Valley. Every year, the department’s Victim Witness Coordinator selects families who have endured tragedy and need extra help during the holidays. 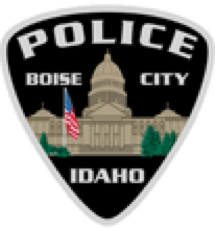 For those who don’t know, the Boise Police Department Victim-Witness Program was developed in response to a need for crisis intervention and support services for victims, witnesses and survivors of violent crime. The selected families are asked to make wish lists for things they want and need. 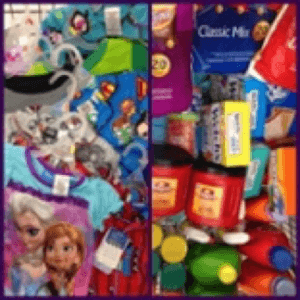 Items typically range from underwear and socks to kitchen necessities to children’s toys. This year, there were a few more large item requests from families, for instance, a young boy with cerebral palsy who desperately needed a day bed. I took advantage of Red Sky’s donation match – they match every employee’s donation, up to $100, on top of the $100 already given to each employee to spend in the community. I was happy to donate $100 of my own money to go towards these deserving families. Altogether, a check for $300 was written to the Victim Witness Program to help purchase items on the families wish list. Ultimately, the Boise Police Department and its employees personally donated nearly $6,000 to these families in need. I’m happy to be a small part of this great contribution. I feel fortunate to work for a company that places community service so high on its list of corporate values. So much, in fact, that during the holidays, Red Sky not only gives to organizations as a company, but they empower the employees with the personal gift of giving – in the form of $100 to use as we see fit. When I think about giving during the holidays, I immediately think of gifts; more specifically, gifts for children who may not otherwise be able to open presents on Christmas morning. One of the great things about the Treasure Valley is the amount of organizations and individuals that make it their life’s work to help others. This can also pose a problem when someone needs to decide who or what to donate money, time and items to. 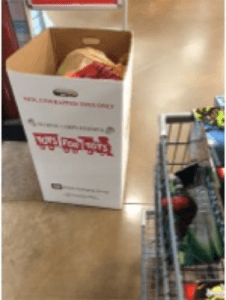 This year, I decided to give to the organization that popped into my head first, and that is Toys for Tots. 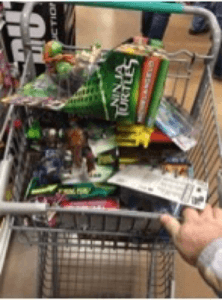 Powered by the U.S. Marine Corps Reserve, Toys for Tots is a well-known program that collects and distributes toys to children in need. One of the cool things about the program is that all toys collected in the Treasure Valley will stay in the Treasure Valley. I appreciate my colleagues at Red Sky who have all chosen an organization or a cause to donate to this Christmas season. 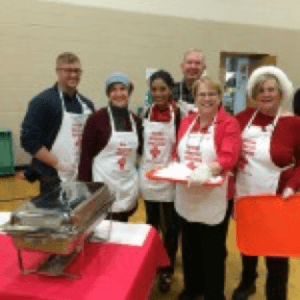 There is no universal “right answer” when it comes to charitable giving, but there is definitely a need for giving during the holidays, and I’m thankful to the owners at Red Sky for giving me the means and the time to give to an organization this year.